Big Bite Nite Video: The Science of Food – Ice Cream! Some things we were just born to do. And, I believe one of the many reasons I was created is to eat at fine dining restaurants. There’s nothing more engaging than the ambiance and personality specific to that particular restaurant – often overflowing with charm, extraordinary music and a special menu focusing on fresh, seasonal ingredients locally grown. What I anticipate the most, while dining at these specialty eateries, is the dessert menu – which often includes homemade sorbets or ice cream made especially for me by the Pastry Chef. Between you and me, I figure I’ve had the very best. That is until I discovered Quattro’s Executive Pastry Chef Philippe Valladares’ vanilla bean ice cream. Let me backup a bit. I have my own personal Best of the Best list for food—we all do. However, on my list “The best place to eat ice cream” category was taken and has been for a couple of years now. In a matter of an hour, Philippe easily captured the honors. See why in part two of our Science of Food video series by clicking play on the video below. 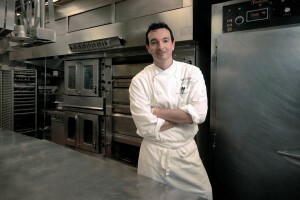 Plus, meet Philippe in person at Big Bite Nite at the Houston Museum of Natural Science, April 30. You will adore what he has prepared especially for you. Who’s your favorite Pastry Chef in Houston? Let us know. P.S. Have you entered the “Show Us You Biggest Bite” Photo Contest yet? (There are great prizes at stake!) I got my Biggest Bite at Quattro while we filmed this video – where will you get yours? Want to make your own homemade ice cream? Kat Havens teaches you how. And, you can try your hand at Philippe’s recipe for Vanilla Bean Ice Cream with the recipe on our web site. And in case you missed it: check out the first Science of Food video, “Butter Living Through Chemistry” with Polo Becerra, Culinary Director, and Adam Puskorius, Executive Chef, of Polo’s Signature. Melodie is a Public Relations Consultant at HMNS. That is a nice looking man – and he makes ice cream! Rawr.